Ashbourne Telegraph review of the Soisy visit. 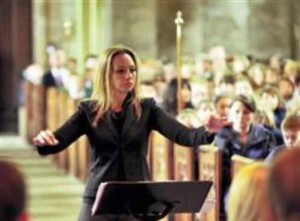 Schoolchildren were treated to a special performance when French visitors to Ashbourne teamed up with the town’s choir. The Orchestra of Soisy sur Seine came to Ashbourne on Thursday last week, where they were greeted at the town hall by Mayor Tom Donnelly. The orchestra then performed at St Oswald’s Church on Friday afternoon with Young Ashbourne Singers in a free concert for youngsters in the town. The children’s event preceded a concert at St John’s Church on Saturday night, all of which were part of an exchange between the singers and the orchestra as part of the friendship movement between Ashbourne and Soisy sur Seine. Musical director of Ashbourne Singers, Linda Perry Smith said: “It was wonderful. Phil Chell, Mick Pepper, Ruth Brailsford and I worked hard to get this weekend organised and it was just wonderful. “It was so sweet to see St Oswald’s full of our children. “We made it interactive for them by saying a bit about the composers and then each musician playing a little bit with their instrument. “The children sang along with Yellow Submarine and the orchestra were very impressed with how smart they looked and how nicely they watched.” Choir members worked hard to provide cream teas and fish and chip suppers for the orchestra members. The group also visited Tissington Well Dressings on Saturday morning and were invited by Ashbourne Singers’ member Annie Maudling, to a candle-making session at her Tissington workshop. Linda Perry Smith added: “The Saturday evening concert was wonderful. “There was a lovely atmosphere and the orchestra played a programme of music that people would recognise. “We sang some French parts and then three movements from Mozart’s Requiem with them. “They ended with Pomp and Circumstance and we joined in with Land of Hope and Glory which they weren’t expecting. It was very moving. The Orchestra de Soisy sur Seine was conducted by Audrey Jous- Basquin and percussionist, Veronique Guillo, is the director of the Conservatoire de Soisy sur Seine, which participated in hosting Ashbourne Singers at Christmastime last year.